I just got back from Santa Fe, NM (my hometown) for a book signing of Back Talk. It was a blast. I felt like such a celebrity (and I got to wear one of my cute new BCBG dresses). 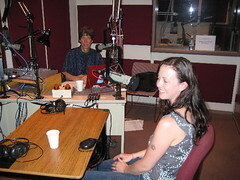 I did two radio interviews (check ’em out in the fabulous new PRESS section of el blogo). I was so incredibly nervous to do a radio interview. Especially since one of the radio shows is hosted IN a local restaurant. People everywhere. No pressure (hah). It was less intimidating than TV, but scary nonetheless. I had to actually TALK about my book!! Good thing it’s a subject I know well. Both interviews were very successful. I found myself thinking “Wow, this book sounds really good”—is that totally conceited? And then I had the book signing. What a blast (and by “blast” I mean scary, overwhelming adrenaline rush). Want to know how well it went? The store sold out of copies! One by one, people started streaming in, and pretty soon the fabulous bookstore, Garcia Street Books, was packed! My signature started to suffer after a while, but that’s part of the charm, right? The owner of the bookstore told me such a sad (secretly gratifying) story: They had a New York Times bestselling author do a signing a few days earlier, and they only sold 2 copies of his book. Poor guy. And no, they wouldn’t tell me his/her name. But the story made me feel muy fabuloso for my own success! Anyway, I won’t bore you with too many details. But I want to thank everyone who’s ordered/bought a copy of Back Talk. I really hope you like it. In fact, if you do like it, I hope you’ll write a quick comment/review on Amazon. That’d be suh-weeeet! And even better news in the land of Alex: I just finished my 2nd book! Yeehaw! I should totally celebrate…. some shopping perhaps? Maybe a day at the beach. I’ll cuddle with the new hubs and our kitties while I think about it. gahh!!! they were out of stock at barnes and nobles!!! must go to bookstore. must find book. must shower and possibly sleep first, but otherwise MUST FIND BOOK!!! I can;t wait to read the book, I must get it, pronto!! Oh, congrats on your successful book signing! I haven’t gotten to read the book yet (I’m trying to get a house first and I have 2 other books in queue already) and already you have another one. You stroke of genius, you. Plus, love the BCBG. Yay, I am so happy for you! The signing looks like much fun and your book is doing so well. Any preview on what book number 2 might be about? Do I get to continue the Gemmalicous adventures? Oh my goodness. Girl, you look FANTABULOUS in those pictures. It’s well put together, not one of those sloppy summer dresses, and you look like you’re having the time of your life. Well, I hope everything’s great. It sure looks that way! I’m so proud of you!! im basically saying what everyone else is, im very very happy for you. also, i think as i have been such a HUGE part in your life (come on, i have) that you should dedicate a future book to me. omg! i’m star struck(: haha!! gna try borders here to get your book!! I’m so glad your signing went well. The one I was supposed to attend with two other YA authors next month fell thru. On my end. Apparently, she was unable to order my books so….I thought that was kind of odd seeing as how libararies have had no problem ordering my books. You can get them thru Ingram, for crissakes! Or hell, I could’ve ordered and brought them myself. I have a theory about the REAL issue is, but I’m not gonna go there. I’m trying to get over the disappointment. Maybe the next one will be better. Congratulations!!! That’s so exciting! I myself, cannot believe that you are not a complete big-head about how well your book is doing! I have to admit that I haven’t started reading it yet because I’m in the middle of Murakami’s newest novel, but yours is next (in fact, I moved a Margaret Atwood book back so I could read Back Talk first. True story). I wonder who the bestselling novelist was…? Re: The man in the turban SHOULD feel humiliated. But so should Ennio Capasa for making an attempt at ruining true male beauty. I’m pretty sure that after you’ve sold a few more copies of your book, you and your hubby will be running around in beautifully coupled Lanvin. I haven’t seen the new HP movie. I’m a bit scared because I think I’ll hate it. I haven’t been wowed by a movie in a long time…I did see the newest Pride and Prejudice the other day, and Mr Darcy was so, so snidge. I loved it…even Keira Knightley. PS. Erm…second book = fini? You’re on fire. ahhhh girl, i love the new go line at target! i am going to put a post up this weekend i hope, i just got back from my two week vacay from work and school. now i am back to the grind. fashion school is killing me with homework and projects!!! ill post soon i promise! i am def. going to check out your book. you should autograph it for me miss celebrity! That is so wicked that you wrote a nook and had it published. And I want to say that I LOVE Stephanie Hale almost as much as I love Stephenie Meyer! Yay, Alex!! Congrats on all your cool events!! I can’t wait to read BT! You are so cool!!! Its so wonderful that you had such a wonderful turnout! Whos your literary agent? I only ask because once upon a time I had a book repped ny Susan Stroman(not the director) of NYC,we couldn’t sell it though! my friend took some quite good pictures on her phone but shes away at the moment. I will get them from her as soon as she comes back. How exciting! I’m def going to buy your book as soon as I hit a Barnes and Noble! Congrats on the success! That is sooooo amazing! I am really happy for you. I only wish you had cruised up I-25 a bit and hit fabuous Colorado Springs! Next time you come West, you better! I just got a call that one of my copies of Back Talk is in, so I’m ready for it. thanks for the comment! i’ll probably buy your book, it looks good. you looked cute, and congrats on the selling out of books! I am speechless! This is all so exciting for you! WOW! WOW! I think I may just Amazon me a copy! Nice affordable price indeed! Congratulations. Sincerely now. New Mexico is your home state huh? Beautiful great historic culturally rich place. I love it. im gonna go ahead and buy it on amazon. woohoo!! WOW you ARE a celebrity! im in europe and they dont really have english books but when i get back to canada, ill look for it! You are a genuine celebrity now! How fun! Congrats. How awesome of you!! I am SO PROUD of you. Congratulations. I hope to write a book one day and be published. Oh boy … and a book signing. How cool is that?? You’re my new hero … or is it heroine. Now I sound like Lou Reed. Congratulations my luscious. I’m soooo proud of you right now… I… um… I ust don’t know what to do with myself. For your next book signing, you have to lush it up in front of the cam and scowl at the photogs. It’s all about the attitude yo. Own the fierceness, for it will shine through.